In our new media class, we’ve been talking about singularity. No longer a sci-fi vocabulary word, singularity is almost here. 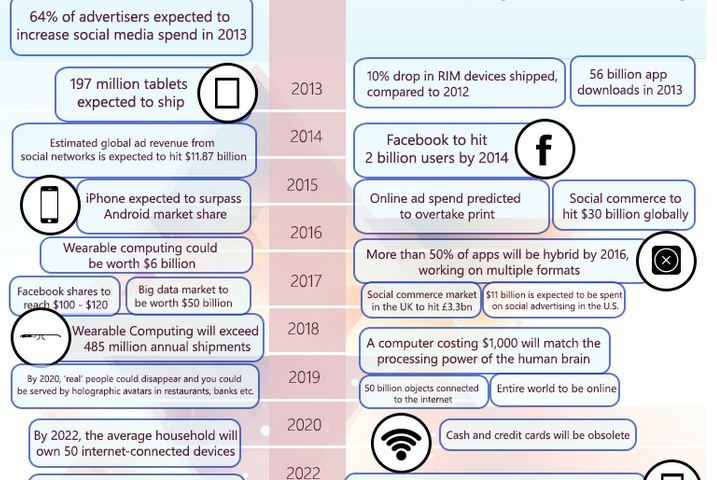 The Future Of Technology Infographic shows highlights in computing, mobile technology, apps, wearable computing, social media, and advertising. Anything surprise you? Anything missing? The Top 100 Tools for Learning 2013 list (released today, 30 September 2013) was compiled from the votes of over 500 learning professionals (from education and workplace learning) from 48 countries. Jane Hart is an independent advisor on Workplace Learning & Collaboration, and Founder of the Centre for Learning & Performance Technologies.